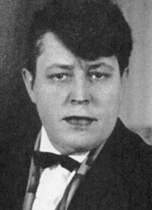 Jane Heap was born in Topeka, Kansas, in 1883 to an English father and a Norwegian/Lapp mother.1 She grew up on the grounds of a mental asylum where her father worked as warden. As a young adult, she attended the Art Institute of Chicago and became a member of Maurice Browne's Chicago Little Theater, a groundbreaking avant-garde theatre group. She was an editor, publisher, and an important contributor to the development and transmission of literary modernism in the United States and Europe during the early 1900s. From 1914 to 1929, Heap worked with Margaret Anderson, her lover, to create the avant-garde literary magazine The Little Review. The magazine's motto was "Making No Compromise with the Public Taste." True to its word, it published articles promoting sexual freedom, feminism and anarchism2 by such influential writers as James Joyce, Ezra Pound, Gertrude Stein, T.S. Eliot, Ernest Hemingway, Hart Crane and William Butler Yeats. Heap also wrote contributions to the magazine, which were recognized for their "penetrating criticism and dry commentary. "3 Openly lesbian, she dressed in a traditionally male manner. Although Anderson and Heap separated romantically in 1921, they continued as co-editors of the magazine in its evolving forms until 1929, and were also bound by Heap's adoption of Anderson's two nephews, Fritz and Tom Peters. Heap lived between New York and Paris and became an important figure in the French expatriate community of artists and writers. She died in 1964 due to complications from diabetes. Heap and Anderson knew A. R. Orage from their literary circles,4 and in 1924 he introduced them to the Work, and to Gurdjieff himself when he visited New York. Heap was immediately attracted to his teaching of self-transformation, and in 1925 she and Anderson relocated to Gurdjieff's Institute for the Harmonious Development of Man outside of Paris. With Gurdjieff's permission she began teaching women's groups in Paris in 1927. In 1929 she decided to end publication of The Little Review in order to focus on the Work. Through Heap, Gurdjieff became well known in the expatriate artists community.5 In 1935 Gurdjieff instructed Heap to leave Paris for London to lead a new study group there, and he then led the group that called itself "the Rope." He appointed Elizabeth Gordon as its secretary, all the rest were lesbians: Kathryn Hulme, Alice Rohrer, Solita Solano, Louise Davidson, Margaret Anderson and Georgette Leblanc. Jane Heap herself did not publish any Fourth Way writings during her life, but she appears in Margaret Anderson's biographies and her The Unknowable Gurdjieff, Fritz Peters' Boyhood with Gurdjieff, and Kathryn Hulme's Undiscovered Country. In 2000, letters she exchanged with her friend Florence Reynolds between 1908 and 1945 were edited by Holly Baggett and published as Dear Tiny Heart: The Letters of Jane Heap and Florence Reynolds. Heap's Work notes were published in 1983 as The Notes of Jane Heap. Anderson wrote a three-volume autobiography, My Thirty Years' War (1930), The Fiery Fountains (1951), and The Strange Necessity (1962). She also wrote a memoir of her time with Gurdjieff, The Unknowable Gurdjieff (1962). "Love your enemies—they may tell you the truth." "Wish is organic. Wish is a movement towards something." "Growth of understanding becomes hunger for Being." "The essence is in the emotions, but not of them. The "I" is in the essence, but not of it." 1. Sophia Wellbeloved, Gurdjieff: The Key Concepts (New York: Routledge, 2003), 240. 2. Holly Baggett, ed., Dear Tiny Heart: The Letters of Jane Heap and Florence Raynolds (New York: New York University Press, 2000), 2. 6. William Patrick Patterson, Ladies of the Rope (Fairfax, CA: Arete Communications, 1999), 202.